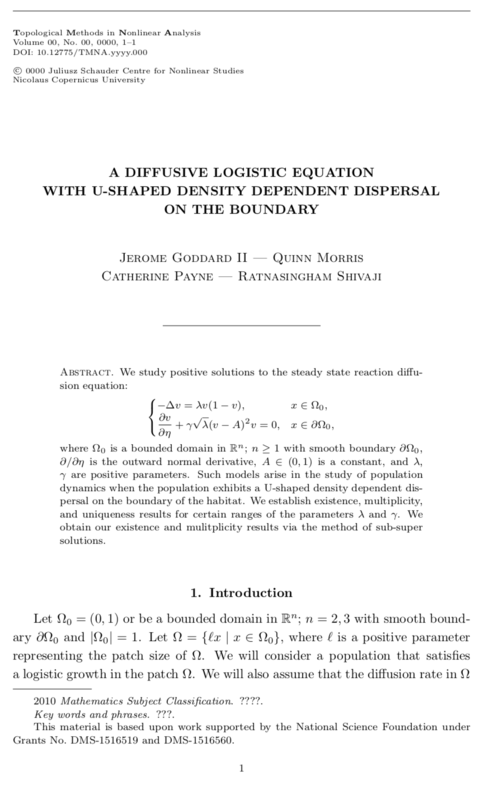 "An Exact Bifurcation Diagram for a Reaction Diffusion Equation Arising in Population Dynamics" was recently published in Boundary Value Problems. I was honored to give remarks to the 2018 Graduates of the Department of Mathematics & Statistics at UNC-Greensboro. Click on the icon for text of my remarks! I am joining the faculty of the Department of Mathematical Sciences at Appalachian State University beginning Fall 2018! J. Goddard II, Q. Morris, S. Robinson, R. Shivaji. 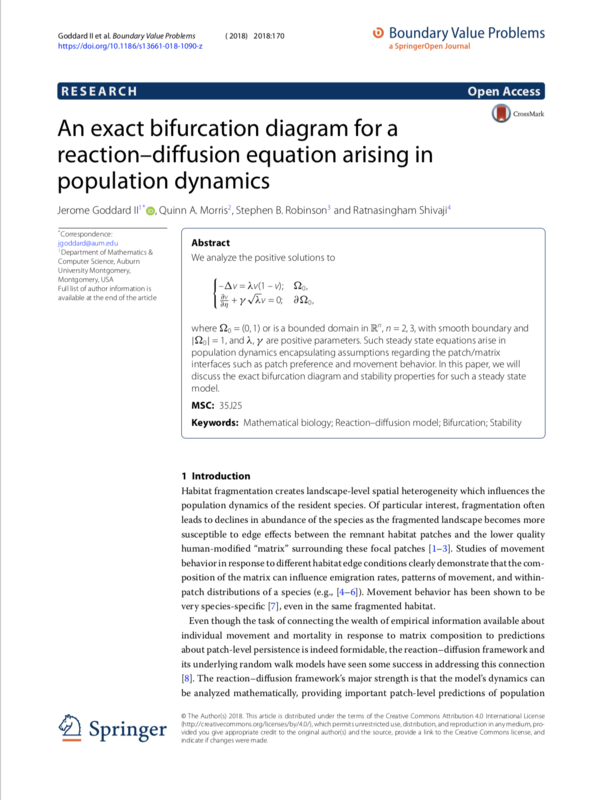 An exact bifurcation diagram for a reaction diffusion equation arising in population dynamics. J. Goddard II, Q. Morris, R. Shivaji, and B. Son. 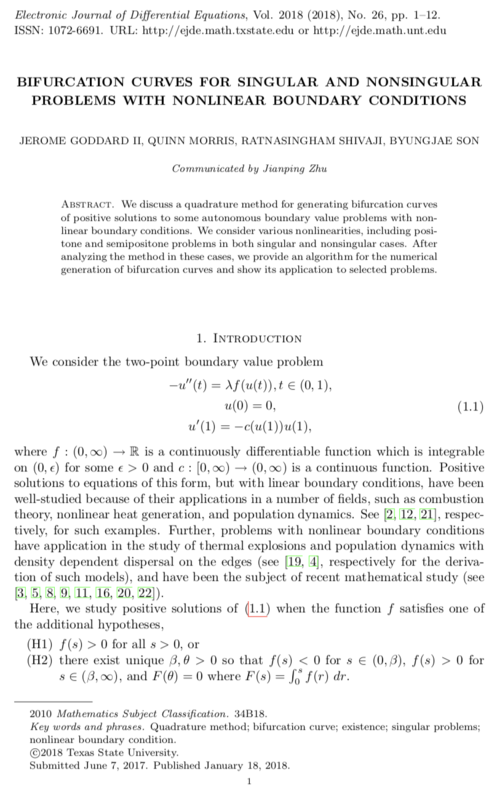 Bifurcation curves for some singular and nonsingular problems with nonlinear boundary conditions. For a full list of publications, visit my RESEARCH page. "There are two versions of math in the lives of many Americans: the strange and boring subject that they encountered in classrooms and an interesting set of ideas that is the math of the world, and is curiously different and surprisingly engaging. Our task is to introduce this second version to today's students, get them excited about math, and prepare them for the future." Don't hesitate to contact me with any questions. Email is usually easiest, but snail mail is always appreciated as well!